Section headings and selected papers. Plenary Session. Directions in intelligent control, K J Astrom. Intelligent Tuning/Control. Intelligent self-tuning PID controller, H Takatsu et al. Adaptive Control. A design of hybrid adaptive control having computational delays, S Shin. Process Control. Adaptive systems in process engineering, M T Tham et al. Neural Network/Self-Tuning Applications. Parameter estimation using artificial neural nets, A P Loh & T H Lee. Implementation Issues. Auto-tuning of multivariable decoupling controllers, C C Hang et al. Adaptive Control. The application of multivariable adaptive control to an industrial run-of-mine milling process, G Metzner & I M Macleod. Plenary Session. Industrial developments in intelligent and adaptive control, S Yamamoto. Robotic Control. Design and implementation of an adaptive controller for a hydraulic test robot, F Conrad et al. Knowledge Based Control. Expert self-tuning PI(D) controller, R Devanathan. Intelligent Tuning/Control. An extended horizon self tuning load frequency controller, K A Lee & H Yee. Plenary Session. Model accuracy in system identification, L Ljung. Control of Drives/Servos/Applications. Dynamic positioning system using self-tuning control, E A Barros & H M Morishita. Knowledge Based Control/Adaptive Control. An intelligent nonlinear adaptive minimum-variance controller, H-U Flunkert & H Unbehauen. Predictive and Robust Control. On the design of the unified predictive controller, A R M Soeterboek et al. Adaptive Control/Knowledge Based Control. A self-tuning feedforward compensator, R Devanathan. 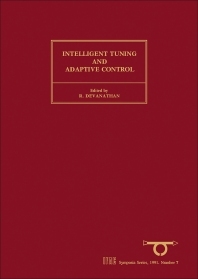 This volume contains 67 papers reporting on the state-of-the-art research in the fields of adaptive control and intelligent tuning. Papers include applications in robotics, the processing industries and machine control.